To the contrary, it might surprise you to know that the chocolate chip cookie was not a purposeful recipe but rather was invented by accident. 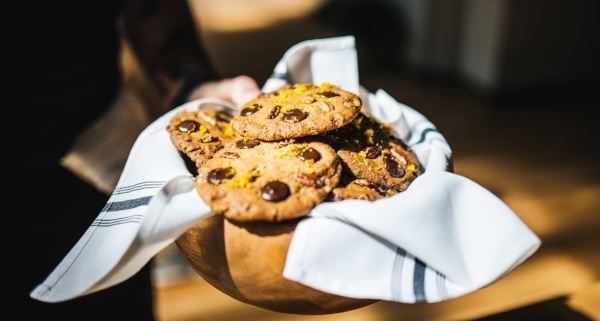 The Huffington Post in a piece by Alison Spiegel reports that in 1930, Ruth Wakefield, who owned a hotel called the Toll House Inn ran out of baker’s chocolate when she was baking her very own chocolate cookies. Thinking she could melt some chocolate into her cookie dough she tossed some Nestle’s semi-sweet chocolate she had broken into small pieces (chips!) into the batter. Only the pieces (chips!) didn’t melt and make the dough all chocolatey---instead they stayed intact and made the dough into fabulous chocolate chip cookies. Thank goodness! And so began America’s love affair with the chocolate chip cookie. Now almost 90 years later, the chocolate chip cookie still remains the staple of households, lunch boxes and milk lovers everywhere. Ditto the popsicle (accident! ), potato chips (accident! ), the Slurpee (big delicious frozen accident! ), corn flakes, pink lemonade and so many other things that we love, love, love and were accidents too. Where is this story going and how does this fit into the making of legal careers? Bear with me. Many students enter law school with their minds set to do one thing and one thing only—become a trial lawyer or a prosecutor, work on real estate transactions, become an expert in mergers and acquisitions, work in a non-profit in a small town. Then life and the universe take over. An internship in a completely different field opens up and that prosecutor-to-be finds that he loved his summer position with a firm that has a huge IP department so so SO much that maybe a few IP classes and a law school concentration will now follow…. and a career too. Not, by the way, as a prosecutor but as an IP lawyer. That future real estate law titan finds that the course in healthcare law--which she took only because it was the one class that fit into her schedule--was so interesting that it leads to a summer spent with a hospital’s government relations office or a government agency specializing in Medicare or a law firm representing hospitals. And that too leads to a career…and not in real estate! The student who wanted only to do non-profit work in a small town? He meets a partner at a large law firm in a big city through a mutual family friend at a backyard barbeque. The partner mentors the student over the next year by e-mail and an occasional lunch and through that a career is launched in a completely different place or environment. At a firm. In a big city. With the opportunity for some non-profit pro bono representation. All of these unplanned experiences open up new career pathways…not by design at all but quite by accident. Many students pursuing their law degree (the majority in fact) often feel a sense of pressure early on, to identify an area of specialty or to somehow immediately zoom in on what they want to do with the rest of their lives. They come into my office sheepishly looking down when I ask if they have a particular interest. They panic when they overhear their peers who seem like they know exactly where they are going and what they will be doing with the rest of their professional lives. I find that self-imposed pressure to be both unnecessary and unproductive to future success as a lawyer. It is better and more likely that those students will find their careers in law through trial and error, through chance encounters with lawyers they meet at networking and other events, and through the classes they will take over their law school careers.